I prefer to start iPhone case reviews with a photo showing the iPhone within a case, so you can immediately see how your device would look inside. For Speck’s new iPhone 6 Plus versions of the super-popular CandyShell, I’m doing something different, because the magic here is hidden inside the case. CandyShell’s one-piece, co-molded design — textured rubber inside with hard plastic outside — has been copied (and admired within the accessory industry) more than almost any case feature in the past five years. With military-grade drop protection and the ability to absorb scratches, CandyShells are the cases I’ve historically used to keep all of my personal iPhones in perfect shape, and I’ve loved them. That changed with the iPhone 6 Plus. Until now, Speck didn’t have a plain old version of CandyShell available, so I switched over to Incipio’s thicker, steel-pinned Trestle. But Speck has just released CandyShell Inked for iPhone 6 Plus ($45, available for $37 and up based on color), joining the earlier CandyShell Grip for iPhone 6 Plus ($33 to $40, also color-dependent). Unlike the standard CandyShell, which still hasn’t been released for the iPhone 6 Plus, both of these cases are visually intense: Inked is offered in a handful of multi-colored versions, while the two-toned Grip adds extra rubber ridges to the back. If you’re looking for a super-protective and distinctive-looking case, one of these CandyShells should be at the top of your list. CandyShells originally debuted for the iPhone 3G and have since been offered for iPods + iPads. They’re some of the most precisely-made cases around, due to the novel co-molding process. 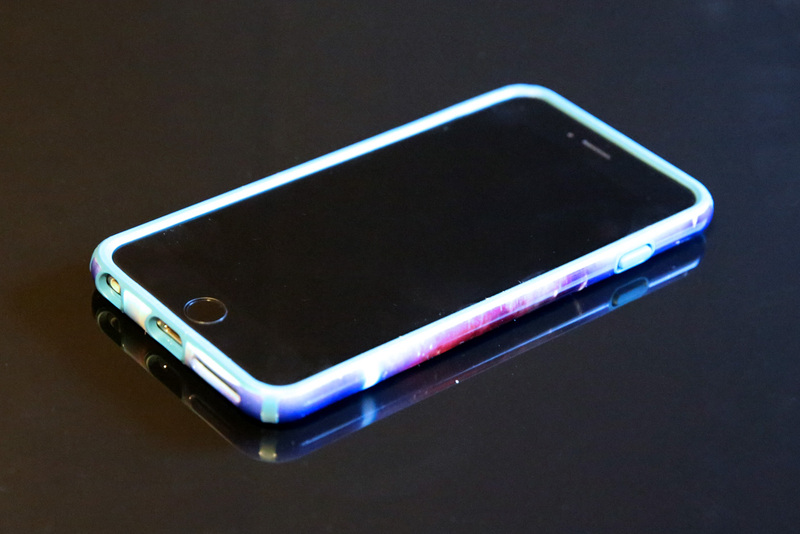 Glossy backs absorb (and show) scratches that would otherwise damage your iPhone; CandyShell Inked uses a UV coating with some scratch resistance. From my perspective, CandyShell Inked offers a perfect balance of protection and access to the iPhone 6 Plus, just as prior CandyShells have done for earlier iPhones. Molded into one piece that’s super easy to put on and take off, the plastic and rubber provide military-grade anti-drop protection, yet in a slender form factor that doesn’t feel as boxy or constraining as typical OtterBox cases. Inked has the best-feeling integrated button protectors I’ve felt so far, which actually make the 6 Plus’s buttons feel more responsive than bare buttons, and also leaves just the right amount of space for accessory port, side ringer, speaker, and microphone holes. It’s also worth noting that Inked’s back is completely flat, allowing the iPhone 6 Plus to rest flush on a flat surface, an issue some users noted with early units of the smaller iPhone 6 CandyShell. Speck’s first few CandyShell generations all used the same visual formula: one matte rubber color that peeked out from the front edges, corners, and holes of a second colored glossy plastic. CandyShell Inked riffs on the concept by saturating the glossy plastic layer with art —protected by a UV coating — letting you choose from different images. The widely-available version shown here is called “supernova,” and there are two floral patterns: a heavily purple one available for $37 at Amazon, and a sketch-like pink Best Buy-exclusive sold for $45. Best Buy also has an exclusive light blue “colordip” gradient version for $45, probably the closest to visually neutral of the bunch. You can decide whether any of the Inked colors appeals to your personal tastes: they’re deliberately eye-catching in ways that will appeal more to some people than others. As a fan of more neutral color schemes, I’m personally anxious for a standard CandyShell to be released for the iPhone 6 Plus, but Speck hasn’t announced one yet, so it could take a while to appear. For now, CandyShell Inked is the closest iPhone 6 Plus owners can get to the classic CandyShell design. 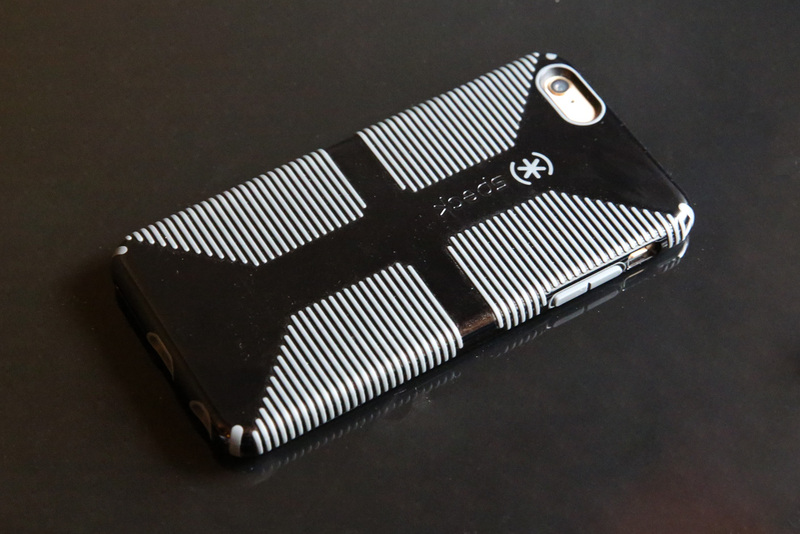 Released late last year, CandyShell Grip is fundamentally the same case as CandyShell Inked, but with one major functional change: the back and sides are augmented with thin rubber ridges that make the case “grippy.” Some people love these grips, particularly for the large iPhone 6 Plus, which can suddenly feel very slippery when a regular CandyShell (or Inked) case is almost completely glossy. Visually, the grips dramatically increase the case’s two-tone color balance, bringing the rubber color normally found mostly on the front and edges to greater prominence on the back. Six different colors are available, including four $33-$40 widely-available options and two (black/blue, white/blue) $40 Best Buy exclusives. Colors and grips aside, the button covers, holes, and other fundamentals — anti-drop and anti-scratch protection — are the same between the CandyShell cases, and that’s a great thing. An iPhone 6 Plus inside a CandyShell Grip is ready to resist pretty much anything except being dropped in water or gouged with keys; even then, Grip’s more rubbery back will hide more scratches than a standard CandyShell or Inked. The choice of which version meets your aesthetic and functional needs is purely personal, but no matter which CandyShell you select, you’ll get a fantastic level of protection without compromising use of the iPhone 6 Plus in any way. CandyShell Inked and CandyShell Grip are both available for the smaller iPhone 6, alongside the standard CandyShell, which remains unavailable for the iPhone 6 Plus.